The emergence of e-commerce has been a disruptive force for industrial wholesale and distribution companies. The supply chain that could once only be accessed via a dedicated distributor now can be tapped—at least partially—online through sites like Grainger. Today's buyers are used to having detailed data on everything from product availability and pricing to their order's precise location en route. Anything less is quickly becoming dissatisfactory. So, traditional distributors find their industry is rapidly changing, and the services they were once valued for no longer provide as competitive an advantage as they once did. Just take this article for example, B2B E-Commerce: The Bullet Train for Today's Wholesale Distributors. The article explains 5 ways e-commerce is creating a seismic shift in the way that today's wholesalers and distributors do business. In addition to adding certain e-commerce functionalities, today's distributors need to emulate the mindset and digital tactics that have helped make e-commerce companies successful, such as focusing on customer experience (CX), supporting omni-channel customers, creating a mobile optimized site, and having a sales team that's dedicated to serving your online channels. According to a survey by Accenture, 86% of US-based B2B companies with over $500M in annual revenues have already implemented e-commerce solutions, and if you don't start now, it will be even harder to catch your largest competitors down the road. Distributors have long had a reputation for great customer service, but if you want to prevail in the digital era, you need more than great service—you need to make life easy for your customer. People no longer have the time or desire to hear a sales call or flip through a dense paper catalog. Instead, people are leaning towards performing their own research, inquiries, and purchases online and at their own convenience. Hence, e-commerce's rapid success. 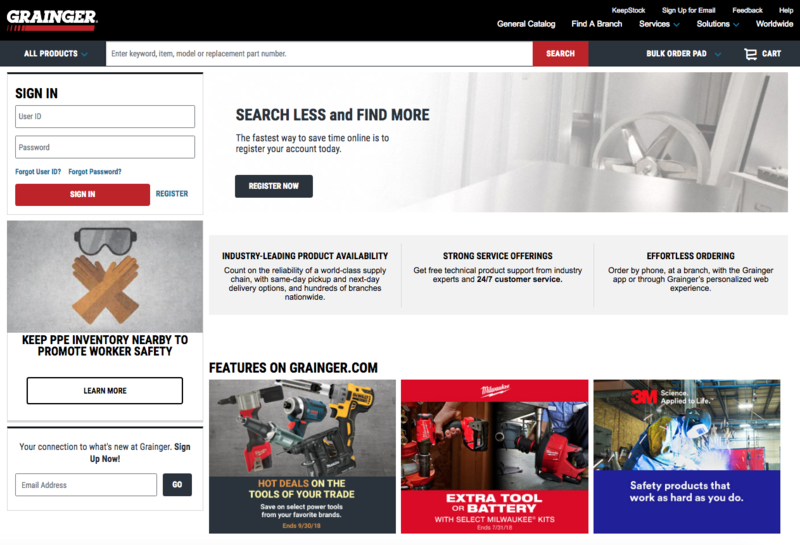 Grainger is an example of an industrial supply chain company that began selling with catalogs and purchasing managers, but in recent years, they transformed themselves by offering e-commerce access on their website and even their own app. For industrial wholesalers and suppliers who have hesitated to compete in the digital space, this expansion by major industrial players into the online space poses a serious threat to any company that has not transitioned towards a better online interface. Establishing and maintaining a well-designed website is absolutely necessary regardless of how niche a distributor you are. On a prospect's first visit to your website, assume they're there because they have a problem they're looking for help solving. Your website needs to communicate just how helpful, customer-oriented, and accessible you are. E-commerce sites have value because they display everything they have—specs, details, images, etc.—right on their product pages. If, as a distributor, your competitive advantage is wrapped up in your services, timeliness, and other value-added qualities, then your site needs to be just as clear and transparent about those aspects of what you do. Make sure pricing and how to get started aren't confusing concepts on your website; do the work and planning necessary to keep everything completely dummy-proof. Grainger, for instance, has an e-commerce platform for many products, but they still go by catalog for a variety of product types. The difference is they've made every catalog fully accessible and easily searchable online. The highly usable, clean design provides customers with all the information they would be looking for. They also provide the option for clients to order catalogs in print, keeping more traditional clients happy. If you're reading this, you're probably a catalog master. You know the exact section, page, and location to find what the client is looking for. Obviously, an advantage of e-commerce sites is that they make digitally-sold products searchable and accessible to the client instead of having to go through a service representative. But you don't have to make the drastic shift to e-commerce in order to make product information more readily available to your clients (or more understandable). In fact, the best way to attract more website traffic is to back every product you produce with more content and more helpful guidance. 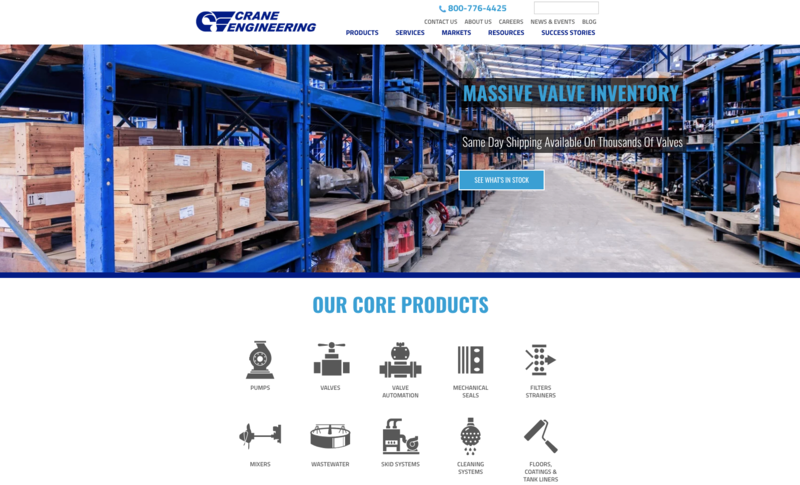 Take a look at Crane Engineering, a pump and fluid processing distributor that's been very aggressive online lead generation. They have beautiful product pages (see below), but they have no e-commerce functionality. Instead, every product is available for quote—not unlike many other niche distributors. The difference with Crane is that their product pages are backed by helpful, informative content that actually generates the traffic to view product pages. 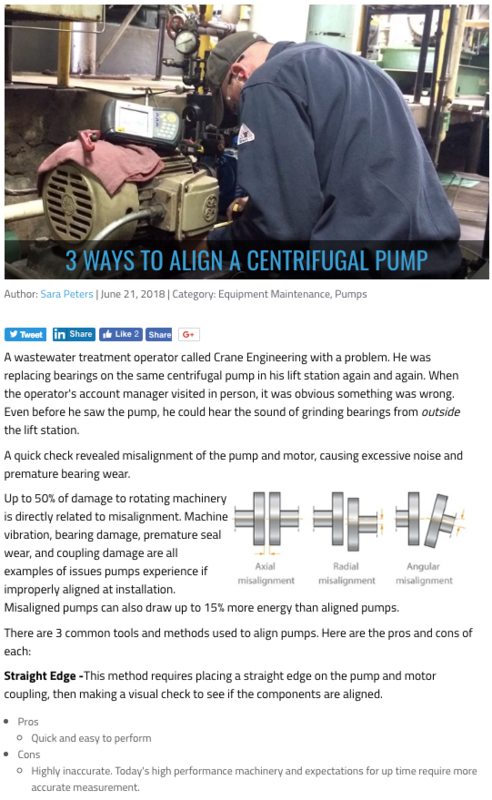 Over several years, they've developed a robust business blog where they write about topics of real concern to manufacturers, plant managers, and maintenance professionals that buy and use fluid processing equipment. Distributors can beat e-commerce every time when they produce new content like the articles from Crane Engineering above. Why? Because Google's algorithm is much more likely to show a helpful article page, like a blog post, than an e-commerce product page. Online, visitors look for answers to their questions far more often than they look for specific solutions, and learning this is the key to effective SEO for industrial wholesale and supply chain. If you've established a content calendar for posting blogs regularly, you want to make sure your leads are able to find it. Likewise, if you're creating content for your buyer personas, it's important that you're using their buyer's journey to guide your ideas and answer their most burning questions. Put yourself in your buyer's shoes and create the type of helpful content that they're searching online for, using the language and keywords they use in everyday conversation. If you do that, you'll undoubtedly win more opportunities. Distributors Understand Traditional Upselling. Now, Adopt Digital Upselling. e-commerce companies today are heavily focused on suggesting products that their existing customers are likely to want or need next—upselling through suggested digital content. This tactic alone has stolen a ton of business from traditional distributors. Yet, in traditional sales situations, distributors are masters at anticipating their clients' needs and upselling them through better services and product offerings. Now's the time that distribution companies convert that sales expertise to create upsell opportunities on the web. Here are three key tactics that don't involve adopting an e-commerce platform. Email is still as relevant today if not more so than it was 10 years ago, and email marketing software has made creating high-quality, personalized emails easier than ever to create. Of course, there is a fine balance between messaging your contacts about helpful opportunities and spamming their inbox. Inboxes are highly saturated with more content and junk than most people care to open let alone read. So, the focus for distributors is to build context over the phone, in email, and on your website. For instance, consider personalizing email from names so that your customers only ever receive emails from the rep they're assigned to. With modern marketing automation technology, such as HubSpot, you can suggest content to your customers when they visit your website, just as an e-commerce company would within their order pages. You can create a unified experience for your customers from email to website to phone. Everyone wants to feel special! You already know your lead's name, industry, and pain points so utilize that information to your advantage, so make every interaction with your prospects and clients a personal one. Greet them in emails by name and include calls-to-action that are relevant to their previous searches and downloads. Especially in distribution, where products are bound to go missing or arrive damaged from time-to-time, customer service is crucial to maintain trust with customers, who paid for something they did not receive. Human error is inevitable, but how to respond and act appropriately when an issue arises, will make the difference between keeping a valued customer and losing them to your competitors. Whether you have e-commerce capabilities or not, digital customer service is essential. Consider adding functionality to your website so that your customers can submit service tickets or get help straight from your website. There are plenty of platforms available to place chat panes on your website. Consider taking that approach, to provide extra accessibility between you and your clients. 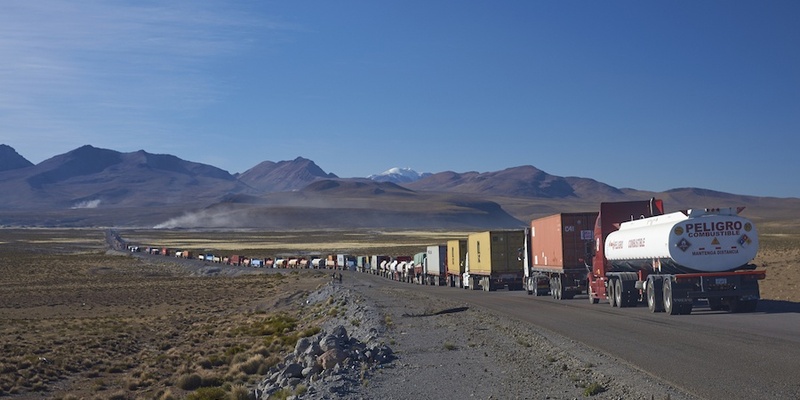 A key factor for successful distribution companies is the flow of data. If you can maintain clean and effective data, then you can do everything I've written about above—personalized content, digital upselling, email marketing, etc. If you can't, well, then it's tough to compete with the likes of e-commerce, because effective use of data is really what e-commerce companies are built on. Amazon has everything lined up—website, CRM, inventory, warehouse, shipping, etc. Every logistic is in the bag. Distributors often have part of their data management process set up, but many times, we find they aren't yet unifying their data with their digital marketing and customer service efforts. Integrating all of your data and systems will not only save you time, money, and headaches, but it will create a better, longer lasting relationship with your customers because of the transparency and understanding you'll be able to generate. The best way to integrate data is by choosing systems that work well together. For instance, does your CRM have the technical capability to talk with your marketing automation platform? Can your ERP communicate with any digital customer service platforms. These are essential technology questions that distributors must face. Listen up, distributors! We're no longer in an age where you're the only specialized company in town. Today, buyers can go online and get exactly what they're looking for shipped right to their workplace in a matter of days. If your services don't meet their standards, then your competitors are just a few clicks away, and your buyers won't hesitate to make the switch. If you can't be found online at all, you're missing out on a wealth of opportunities, as more than 75% of today's industrial buyers start their research with a query on Google or another online database. Making e-commerce style changes isn't just something that can help boost your sales; it's a move that will save your business from failing as more and more buyers move online. Frank has been key to establishing Weidert Group as an inbound marketing leader over his 10+ years with the agency. He has a knack for using technology to amplify smart marketing strategies, and a deep knowledge of SEO and content promotion, exceptional project management skills, and a thorough understanding of HubSpot's marketing and sales products.